Managing Complex Fire Protection Design at Ronald Reagan Washington National Airport (DCA) - Arora Engineers, Inc.
Arora Engineers, Inc. (Arora) recently served on the team to relocate the passenger security screening checkpoints at Ronald Reagan Washington National Airport’s (DCA) B/C Terminal. 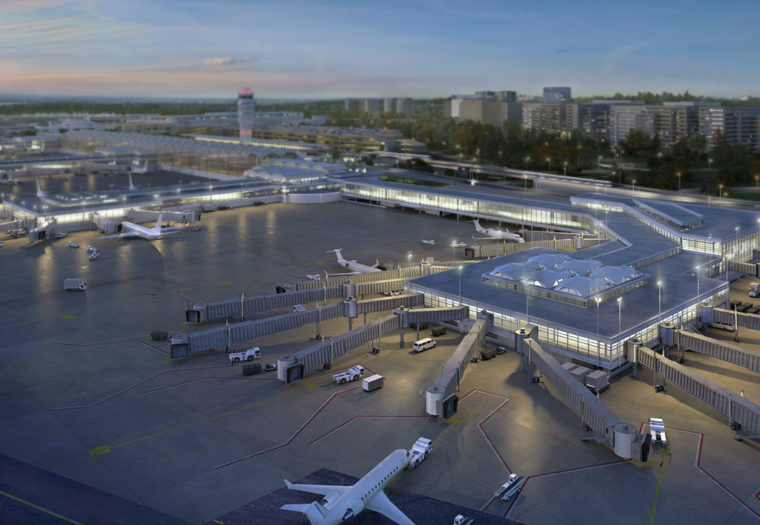 In providing plumbing and fire protection design services, the team produced creative solutions to accommodate the complex roof forms of the new security checkpoint buildings. Typical fire protection systems are designed for a flat or sloped roof; therefore, it will usually only vary in two directions. 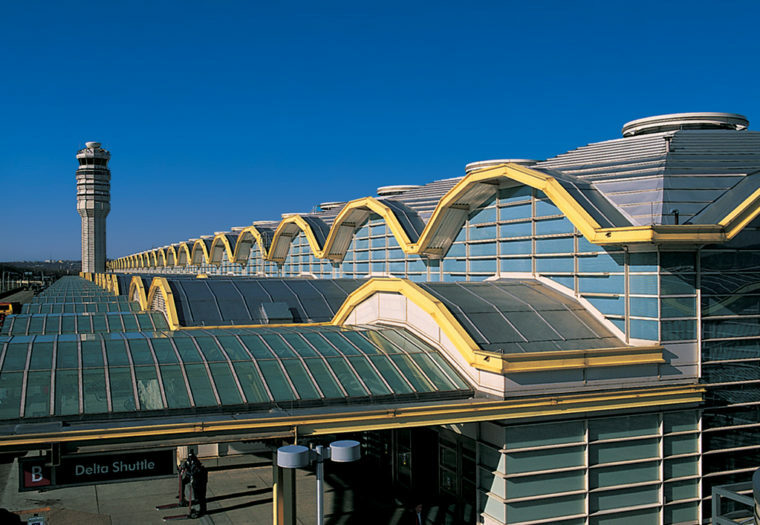 However, the roof of DCA’s new security checkpoint buildings has a tilted-wave-like design, meaning the roof varied in three different directions (an XYZ system). In the design approach, Arora was tasked with getting the sprinklers placed up high, but still being able to manage the wet system. Therefore, they had to consider regulating pressure losses and not exceeding the current pressure system supply. Maintaining cost and adequate safety measures were also critical to the design. In a sprinkler system, you are always draining back to a common source for testing purposes, so the system can be inspected. In this space, the team had to look closely at the elevation in the design (foot-by-foot increments along a 400-foot span, per building), be mindful of the routing, and they had to avoid pitfalls of low points and artificial high points. Through their creative efforts, the team was able to match the profile of the roof, while maintaining a positive slope back to a common drain. The team also focused on the routing below the structure, again considering the wet system they were working with. A key concern with these types of systems is that they must be protected from freezing while crossing through an unconditioned space. In this design, the source water was on the opposite end of the building from the point of use, therefore the piping had to loop back around to get to the ceiling. There was no right way of direct piping in this design. Keeping pressure loss in mind, as well as water demand, the team had to decrease the size of each individual system, while increasing the number of zones. These constraints generated multiple iterations of the Fire Protection design. The system was routed half a dozen times, and the team had to collaborate with other disciplines in organizing the building systems (e.g. lighting, electrical, public address, etc.) in limited ceiling plenum. There was also an aesthetic quality to consider by maintaining the spacing from sprinkler to sprinkler.